A lot of you have told me you love hearing about what I do and where I eat when I’m traveling. 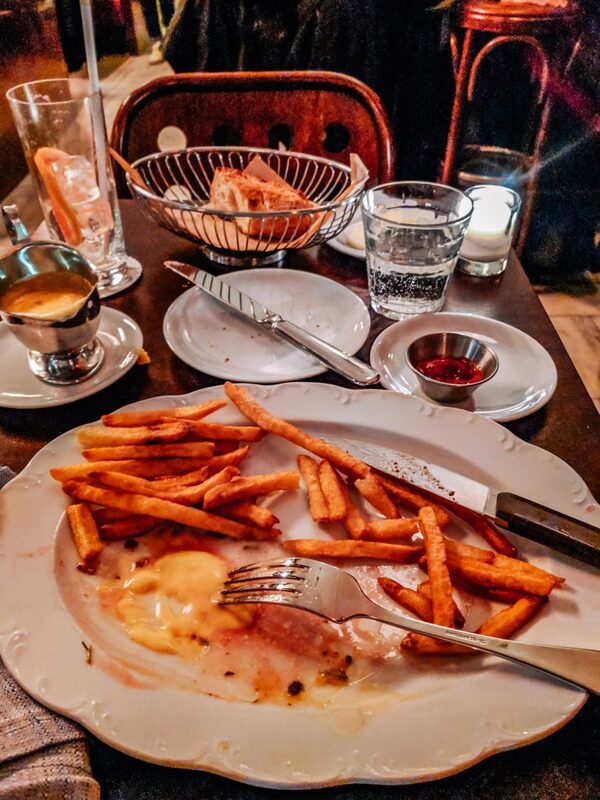 Today I’m sharing my experience of dining solo at one of the most talked about restaurants in New York City: Frenchette. During a quick visit to New York last week I found myself with a Saturday night completely free of plans. 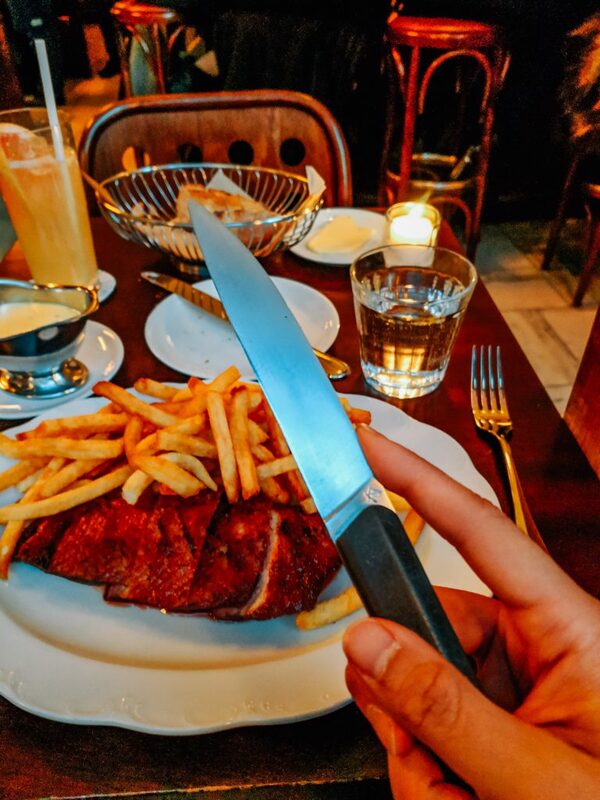 I decided to take advantage of my singleton status and try my luck at getting a table at a restaurant I’ve been dying to eat at for some time, the TriBeCa restaurant Frenchette. 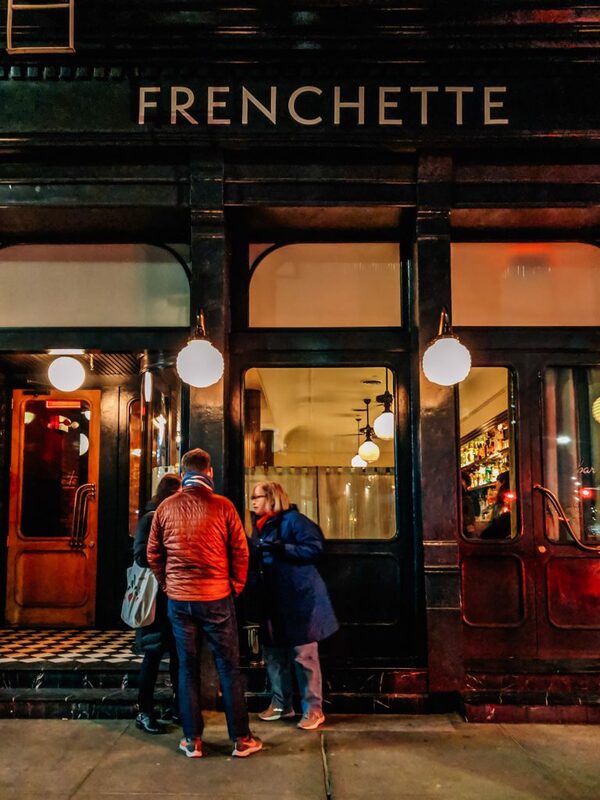 Opened in April 2018 by chefs Riad Nasr and Lee Hanson, Frenchette is their first venture outside of the Keith McNally empire that made them famous. For 25 years they worked as cooking partners, directing the kitchens of some of the most storied New York brasseries of the last couple decades: Balthazar, Minetta Tavern, Pastis, and Schiller’s. Although it’s consistently one of the most difficult dinner reservations in town, I knew that a number of tables (according to Eater, a third of the restaurant) were reserved for walk-ins. Because it was a particularly cold and windy day, I was hoping that less determined diners would stay at home and I would have a better chance of getting a spot at the bar sooner rather than later. The bar area is first come, first served. Arriving around 6:30pm, as soon as I walked in I could see the bar was already full. Initially the hostess said I could just wait around to see if a bar stool became vacant, but before I could respond, the host next to her interjected with an offer of sitting a bar table instead. I said yes, of course, and was prompted ushered to a snug little table at the far end of the bar. 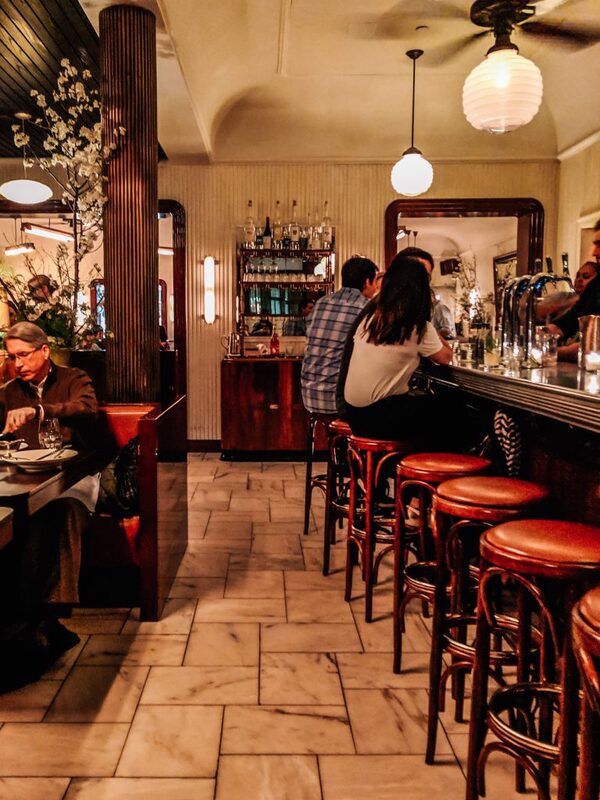 I had recalled that Pete Wells of the NY Times had mentioned in his review that the small tables were too small, and I have to agree that they are quite petite. Even I, a 5’1″ Asian lady, found it a slightly precarious feat to shimmy my way past the neighboring table and into the banquette seat. I managed by performing an abbreviated version of the make-yourself-as-small-as-possible awkward shuffle usually reserved for scooting to your theater seat one minute before a play starts. However, once settled in place I found my seat particularly pleasant, with a great view of the entire restaurant. I watched as the bartenders diligently filled cocktail orders at the bar and watched as other patrons came and went into the restaurant. The crowded bar area was filled with a pleasant hum of conversation mixed with the sharp clinks and clangs of people enjoying their drinks and food. As the daylight began to slip from the room, the space picked up a warm amber glow from the handsome lighting fixtures scattered throughout the space and the votive candles set upon each table. 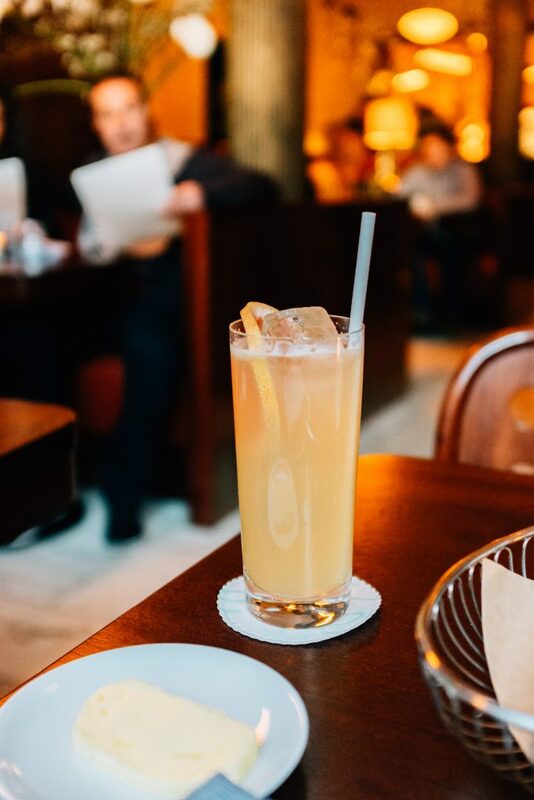 I don’t know what it was exactly – perhaps a combination of the friendly, attentive service, the reassuringly lively noise of the bar area, and the comfy leather bench that wrapped around me – but I felt positively at ease and comfortable in the restaurant. Not once did I feel self-conscious about eating alone, which sometimes can be the case in less intimate-feeling dining establishments. Although there are no non-alcoholic drinks listed on the menu, I asked if the bartender might be able to whip up a spirit-free cocktail for me, a request with which they happily obliged. 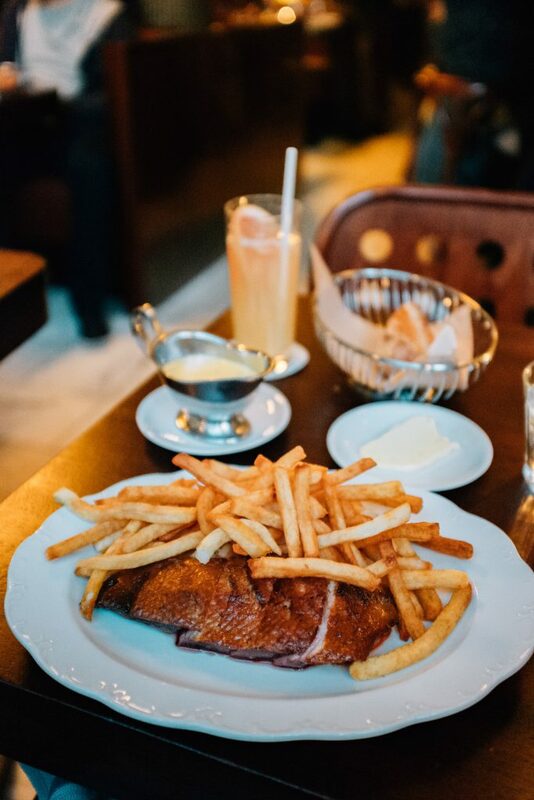 After consulting with my server, I decided upon the much talked-about Duck Frites for my entree. Since I was by myself I didn’t think I would be able to handle much more food, so I passed on ordering some of the other items that piqued my interest on the hors d’oeuvres menu like the Chittara Pasta or Asperges Blanche. 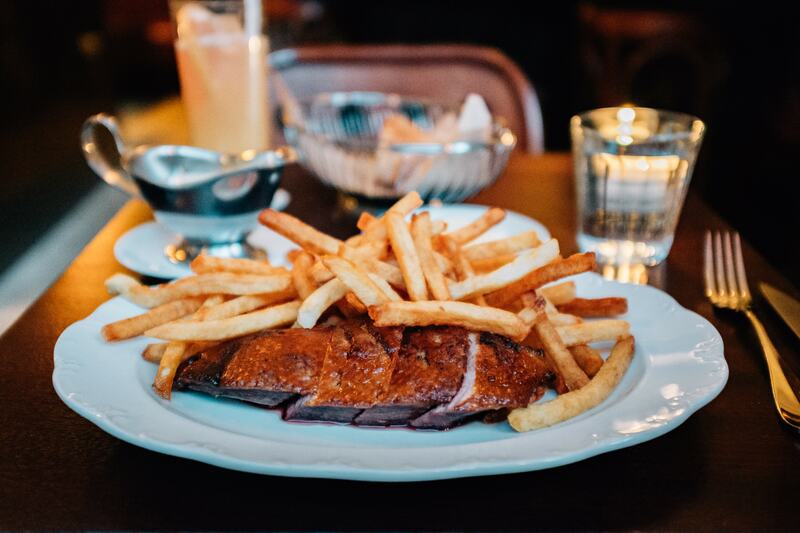 Even though I was a bit skeptical, not really being a huge fan of French food, nor a particular lover of duck, I found the duck frites quite delicious. The generous serving of breast featured a wonderfully crispy skin with a wonderfully soft layer of fat hiding just underneath. Alongside the meat was a whopping portion of magical french fries that somehow never turned soggy through the length of my meal. A giant gravy boat of Bearnaise sauce also comes with the dish, which I decided to pour on sparingly because the duck was just too tasty to drown out with sauce. I will say, I don’t really understand the reasoning for the backwards knife, in which the blade is on the flat rather than the curved side. I had to consciously check myself every time I picked up the blade to make sure I had the sharp side down, and to be honest, I don’t think it’s very easy to cut with a straight edge. It was a comforting, tasty meal that I completely demolished. I could definitely see myself happily ordering this dish over and over again (if I had unlimited funds and unimaginable luck in getting reservations). A moment of real talk: I will not lie, Frenchette is by no means cheap. My entree alone was $42 – a pretty hefty chunk of change to drop on just one dish. It’s for that reason I’d classify Frenchette as the perfect location for a special occasion meal or night out on the town. 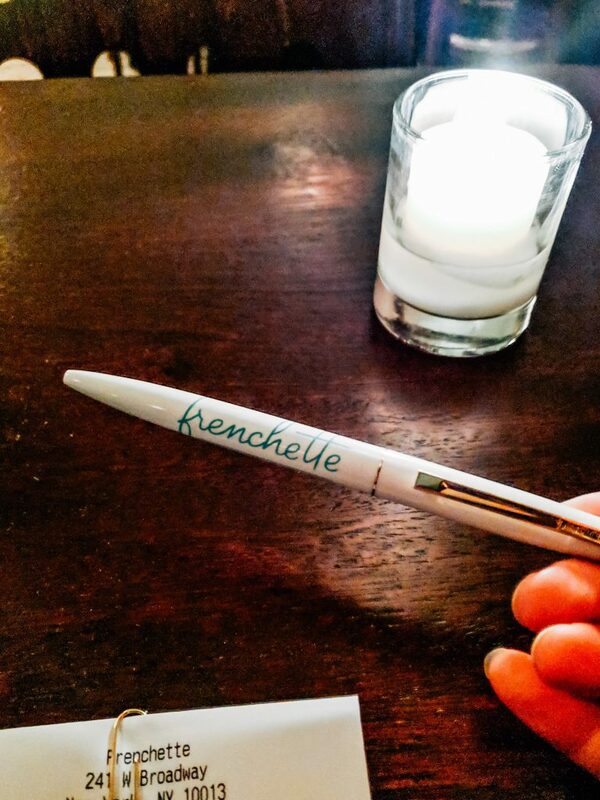 Definitely thought about swiping this adorable branded pen they give you to sign the check. Have you made it to Frenchette yet? 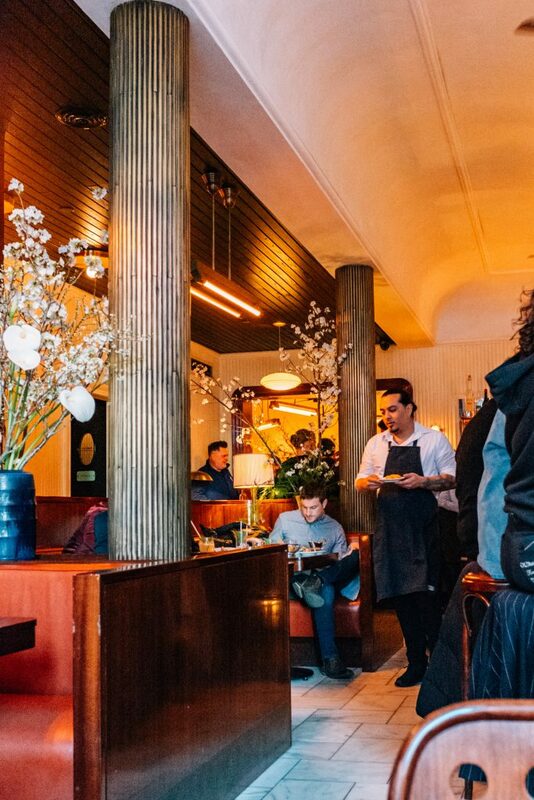 Do you think this restaurant (now one of the finalists for the James Beard Foundation award for Best New Restaurant) be on your list of New York must-eats? I hope you enjoyed my little run down of what it’s like to eat solo (and without a reservation) at Frenchette. Thanks so much for reading! Let me know if you’d like to see more mini-reviews of the places I eat while I’m traveling outside of Denver.